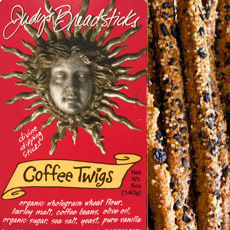 Twigs - Coffee - 5oz. INGREDIENTS: Organic wholegrain wheat flour, barley malt, coffee beans, olive oil, organic sugar, sea salt, yeast, pure vanilla. Fabulous with latte's and gelato.